The Allovest startup project was perhaps the single largest and most interesting project I’ve gotten to be a part of. The founder, myself, and other talent involved met weekly at our offices to discuss progress and constantly refine our direction. From a technical standpoint, I wrote a program to read through 2TB of U.S. Department of Labor (DOL) 401k data to load it into our system. I wrote programs to gather and transform mutual fund data from MorningStar and Lipper. And finally, I wrote a program to import daily end-of-day mutual fund pricing information. And all this was just for baseline data needed by the actual application engine. This application engine consisted of a variety of user input, 401k plan basics, and desired retirement goals fed into a MATLAB program that could determine the optimal allocations that should be assigned to funds within the user’s 401k plan with a high level of confidence. The mixture of system design and financial functionality was very unique and rewarding to me. 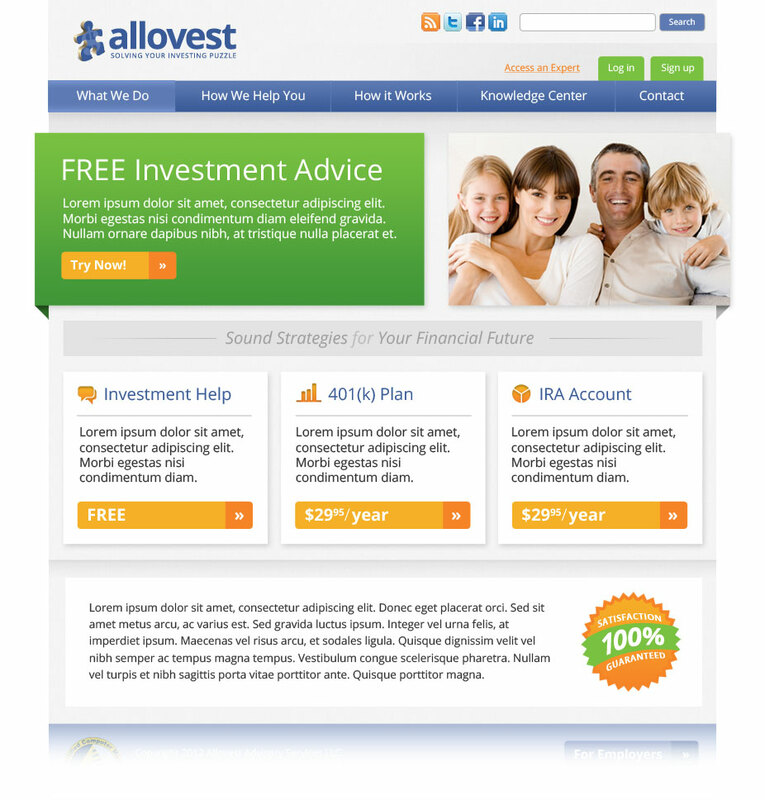 Home Page: The Allovest Home Page consisted of a clean design that aimed to move visitors along into our experience pipeline that consisted of a free “strategic” report breaking down general stocks / bonds / cash allocations with a later push to subscribing for the “tactical” report that recommends specific breakdowns by detailed fund asset classes as well as optimized portfolios for specific funds within the user’s 401k plan. 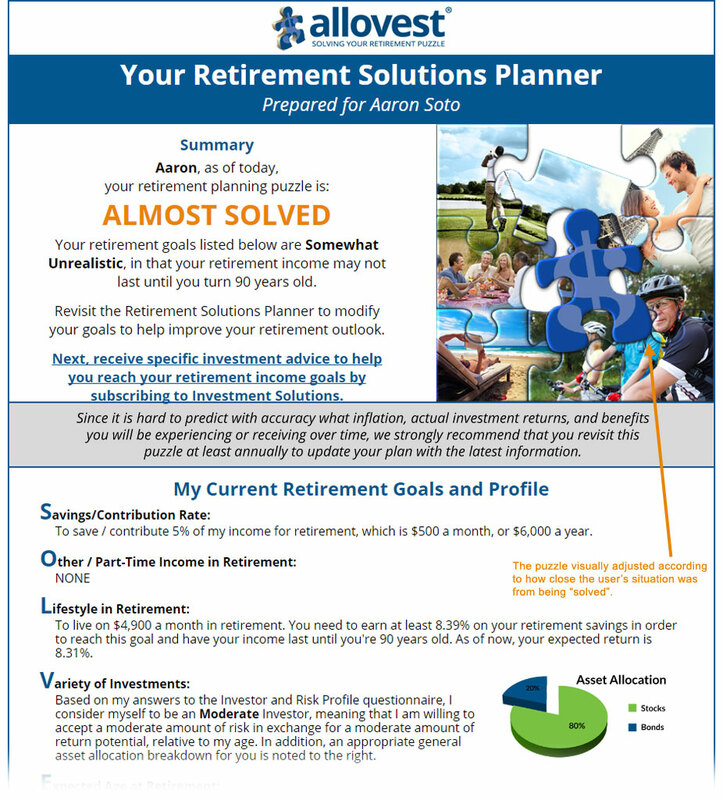 Free Strategic Report: The strategic report, named the “Retirement Solutions Planner”, was obtained after three relatively short questionnaires to score the user’s current financial/retirement goals, ability for risk, and willingness for risk. The main output was a determination if the visitor’s goals could be met and which general stocks / bonds / cash breakdown best suited them. 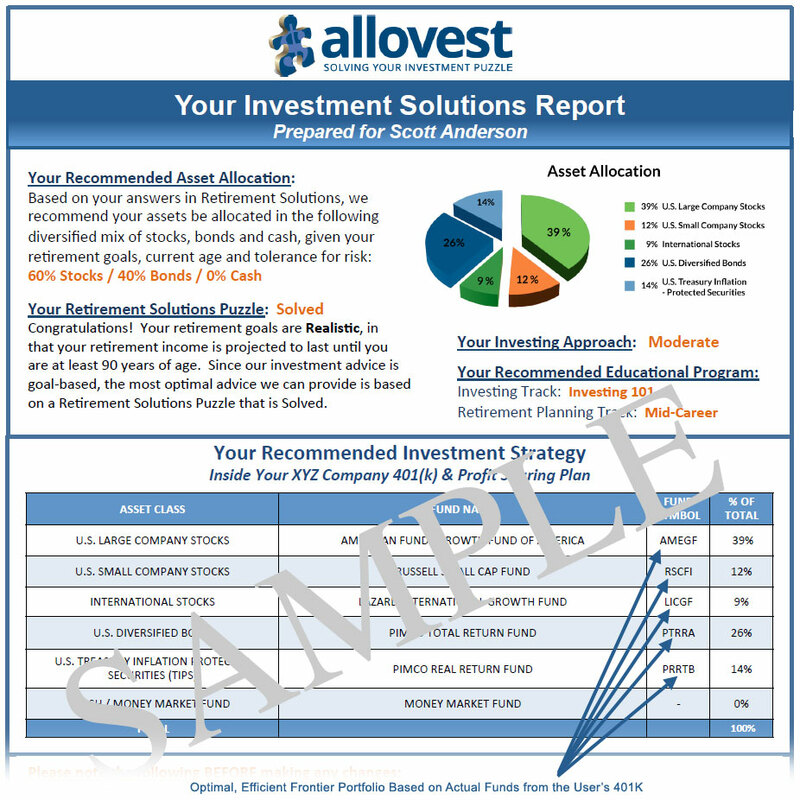 Paid Tactical Report: The tactical report, named the “Investment Solutions Report”, was available after subscribing and choosing your company’s 401k plan (or entering plan details yourself for smaller companies not required to register with the DOL). This output used the baseline information from before, but also applied a two-tier filter to the funds available to the user within their 401k to run a mean variance optimization in MATLAB producing an efficient frontier optimized portfolio that minimized risk and provided an optimal breakdown of how to allocate one’s investments into their available funds.